When I last wrote about transforming a stela, I wrote about removing an old coating on a small stela fragment. Well, stelae come in all shapes and sizes, and I just finished treating another one! We just opened Ancient Egypt: From Discovery to Display, which highlights some of the Penn Museum’s Egyptian artifacts while our larger galleries are being renovated. This was the perfect time for some of the pieces that have always been on display to come into the conservation lab for a little bit of TLC (tender loving conservation). 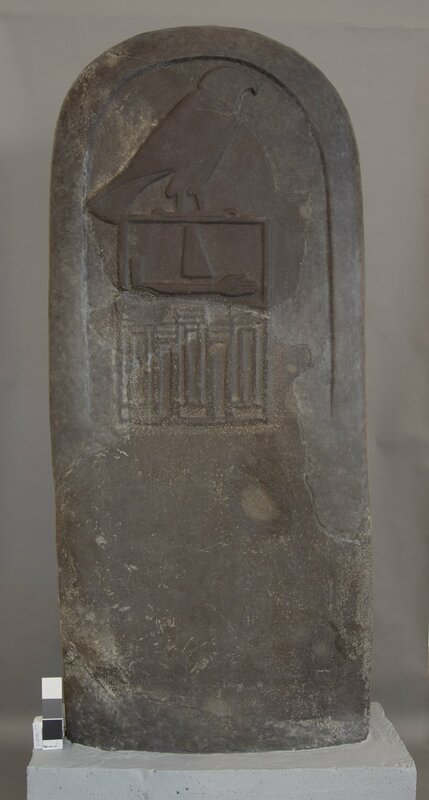 This stela is a black quartzite monument for the pharaoh Qa’a, the last king of the First Dynasty in Egypt, around 2910 BCE. It is about five feet tall and shows a falcon representing the god Horus standing atop a serekh (a boxy decoration representing a palace) containing the hieroglyphs for Qa’a’s name. 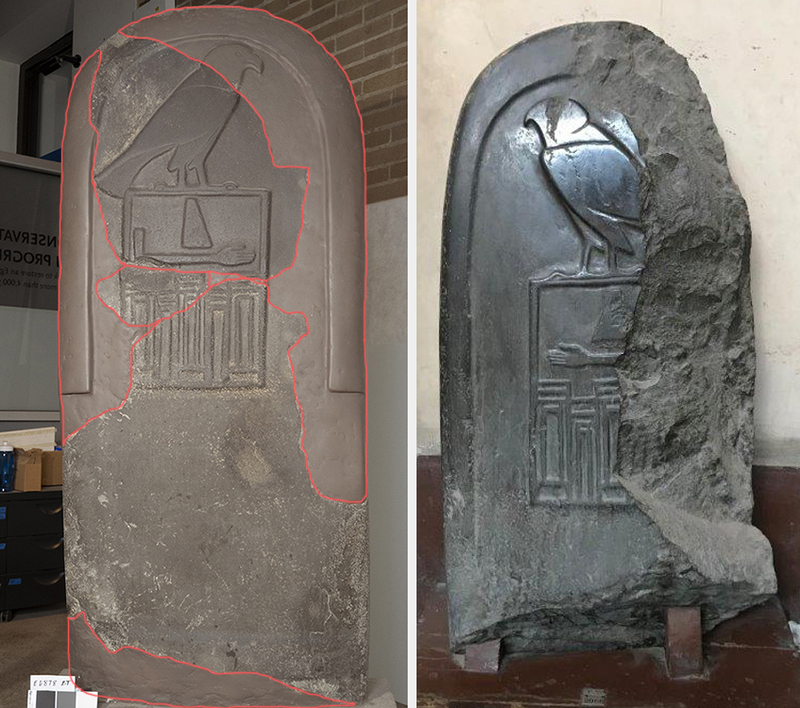 The Penn Museum Qa’a stela (E6878) before treatment with old restored areas outlined in red (left) and the Cairo example (right). A letter from Penn Egyptologist Sara Yorke Stevenson to the archaeologist William Flinders Petrie in 1901 declares that the restoration “gives an idea of life”. As you can see in the image above, the stela was heavily restored with cement in the early 1900s to make it look whole. Unfortunately, the restoration had given Horus a somewhat comical expression. With a big beak and tiny eye, he looked perpetually disappointed and definitely not stylistically appropriate for his time. Fortunately, our statue has a mirror twin in the Cairo Museum, which it would have been paired with on site in Abydos. Because the one in Cairo is mostly intact, we can use it as an example of what ours would have looked like. The head and beak are much smaller and simpler, giving Horus the look of a bird of prey. With the curators, we decided to give Horus a facelift based on the Cairo Museum example. First, we did some digital mock-ups of how the head would look before I painted the outline directly onto the restored area. Using a Dremel rotary tool with a grinding stone attachment, I shaped Horus’s head and beak to more appropriate proportions, which was a very dusty but very satisfying process. Since we didn’t have any good examples of what the eye might have looked like (the Cairo Museum face is damaged), I filled this area using Paraloid B-72 and glass microballoons. I also sanded down the squared-off edges of the restored border so they sloped down into the background, again like the Cairo Museum stela, and smoothed some of the rougher areas of restoration. Horus’s reconstructed head before treatment (left), with rough digital sketch (center), and during reshaping with the Dremel (right). Please note that I only reshaped what I knew was the restoration material! Conservators never make changes to original parts of objects. Once the curators were happy with the shape of Horus’s head, it was time to move on to painting. The previous paint that covered the cement was a color that didn’t quite match any of the tones in the stone – fine for display in a dim gallery, but the stela’s new home would be more brightly lit. Finding the right color was challenging because the top fragment, which was found a few years after the bottom pieces, is a slightly darker color than the rest of the stela. I decided on a mid-tone that worked with the base color of the surrounding original stone, and then used a sponge to layer lots of highlights and darker shades to blend in with the actual artifact. I also used paint to create the optical illusion of “finishing” the bottom left corner of the serekh so that it appears complete from a distance. The Qa’a stela after reshaping and repainting the old restoration. You can now see the Qa’a stela and lots of other amazing Egyptian artifacts in Ancient Egypt: From Discovery to Display. 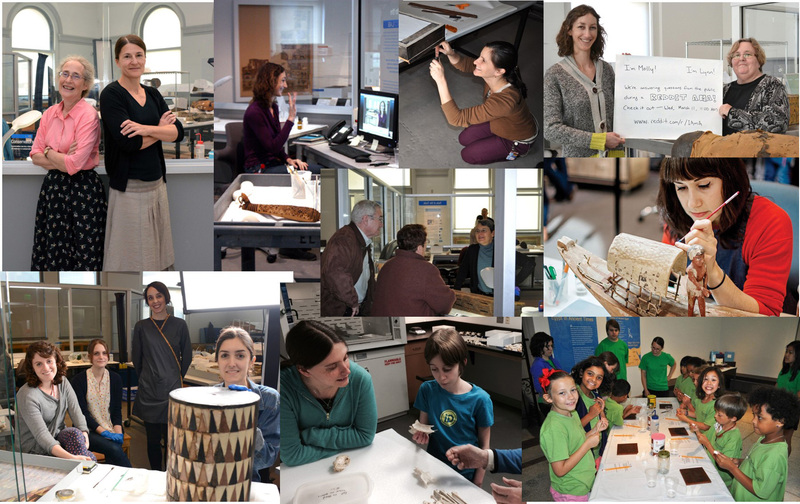 The Artifact Lab has also reopened, and we look forward to being able to talk to everyone about the work we’re doing to prepare for all the exciting changes at the Penn Museum. We have not posted on the blog in awhile, but that doesn’t mean that we haven’t been up to our eyeballs in work! In fact, the Artifact Lab has been closed to the public since the week after Thanksgiving but it re-opens tomorrow as part of a larger exhibit, Ancient Egypt: From Discovery to Display. This new exhibit will highlight some of our Museum’s excavations in Egypt around the turn of the last century (in Memphis) and in the present day (in Abydos). 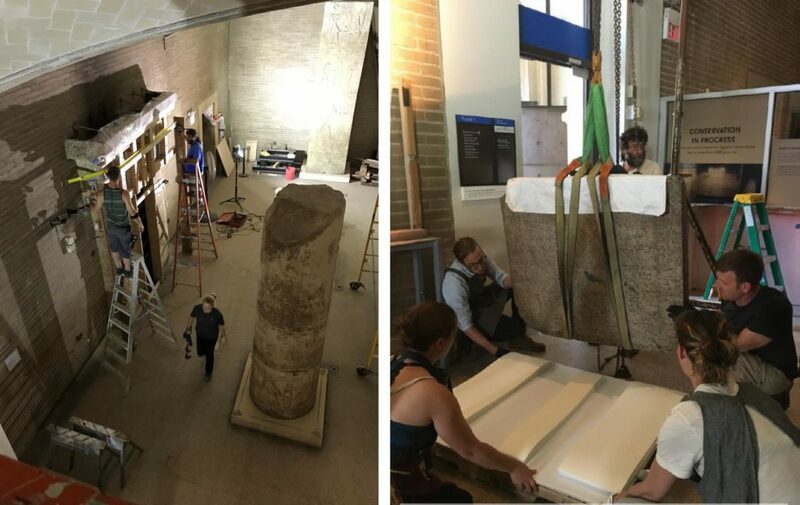 It also will include artifacts that were previously on display in our Lower Egyptian gallery, which we closed last July to begin conservation work on the monumental pieces previously displayed in that space. This work is in preparation for the future opening of our Ancient Egypt and Nubia galleries and is part of our larger Building Transformation project. 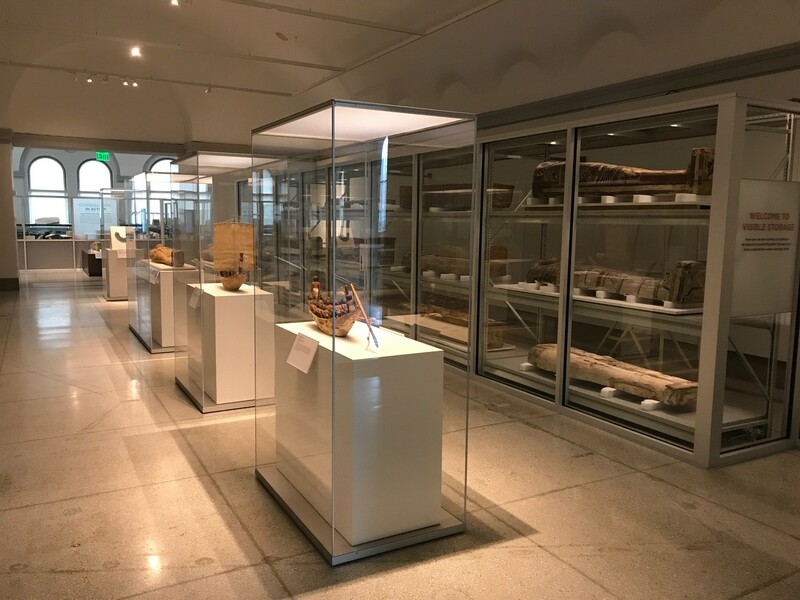 Another feature of Ancient Egypt: From Discovery to Display is a visible storage area, adjacent to the Artifact Lab, which will show coffins, mummies, and other funerary materials on “display” on storage shelves. Some of this material was treated recently in the Artifact Lab while other pieces are awaiting treatment in the upcoming months. Display cases in this space contain some pretty stellar pieces including 2 painted wooden boat models from the First Intermediate Period and the faience broad collar that was recently re-strung. Gave formal presentations about our work in the Artifact Lab at five professional conferences and eight other professional events/venues. They were all great but the 2015 Death Salon was definitely a highlight. AND we had fun doing all of it! Stay tuned for updates on some of our recent work, including treatments for objects that are in Ancient Egypt: From Discovery to Display and for the upcoming Mexico & Central America Gallery!